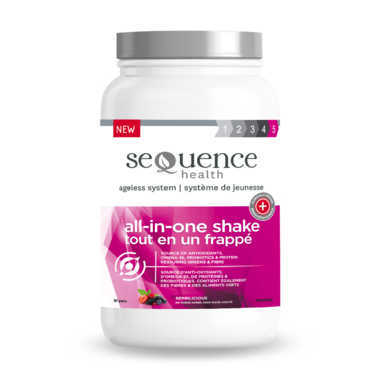 All-in-One Shake is uniquely formulated to meet the nutritional needs of adults. With clinically proven nutrients that support healthy aging: STRENGTHEN - Alfalfa, Pumpkin & New Zealand Whey Protein; PROTECT - Colostrum, Probiotics & Green Tea Extract; REVITALIZE - Organic Greens, Fruits & Vegetables; NOURISH - Moringa, Fiber & Omega-3s. Dose: Adults: 1 scoop once per day (the container holds about 20 servings). Mix well in 1-2 cups of liquid (water, juice) immediately before consumption. Medicinal Ingredients per scoop: New Zealand Whey protein concentrate (Bos Taurus milk from grass-fed, hormone-free cows) 9000 mg (80% protein); Alfalfa protein concentrate (Medicago sativa herb top) 5000 mg (50% protein); Organic Pumpkin seed powder (Cucurbita pepo seed) 5000 mg (67.5% protein); Pea protein (Pisum sativum seed) 5000 mg (85% protein); Fish oil (from Clupeidae and Engraulidae) (Contains 6% DHA and 9% EPA) 670 mg; Bacillus coagulans MTCC5856 (1 billion CFU/g) 166.667 mg; Organic Chlorella (Chorella vulgaris) whole broken cell 300 mg; Organic Kale powder (Brassica oleracea var viridis leaf) 300 mg Organic; Spirulina (Arthrospira platensis whole) 300 mg; Bovine colostrum (Bos taurus, grass-fed) 200 mg; Organic Moringa (Moringa oleifera leaf) 100 mg; Papaya (Carica papaya fruit) 35 mg; Green tea extract (Camellia sinensis leaf) 25 mg (Standardized to 98% polyphenols, 80% catechins, 50% epigallocatechin 3-gallate, 80:1 extract equivalent to 2000 mg crude herb); Stem bromelain (Ananas comosus var. comosus stem, 90000 FCC PU) 25 mg; Organic Shiitake (Lentinula edodes fruiting body) 7.91 mg. Non-Medicinal Ingredients: Organic Acacia gum, organic apple, organic beetroot (red), organic blueberry powder, organic broccoli powder (Brassica oleracea italica), brown rice protein (fermented), organic carrot root powder, citric acid anhydrous, organic cranberry powder, natural mixed berry flavour, monk fruit extract, organic orange fruit extract, organic sweet cherry (Prunus avium) fruit extract, organic spinach, stevia rebaudiana leaf, organic strawberry, organic tomato. Does NOT contain wheat, soy or artificial sweeteners.